Bufflehead are one of our most amusing ducks. The simple black-and-white plumage of the male Bucephela albeola might appear bland but not if you see one well and in the sun in which case the iridescence on its head shines. Bufflehead also have rather shockingly pink feet which they deploy like landing gear as they come to their clumsy landings. 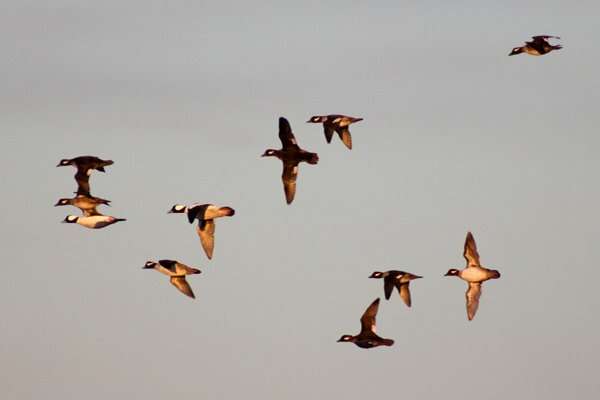 Watching a flock rocket overhead as they go to roost for the night is perhaps my favorite way to see Bufflehead though I must say I also enjoy watching an entire flock dive down beneath the surface leaving only ripples on the water. It is also entertaining to watch them launch themselves straight into the air from the surface of the water like a puddle duck would instead of running across the surface to get airborne like most divers do. Bufflehead are the smallest of North America’s diving ducks. They breed across Canada and Alaska’s boreal forest near ponds and lakes, using nest holes made by woodpeckers, almost exclusively flickers. In winter most head to the coasts though some stay inland on open water. 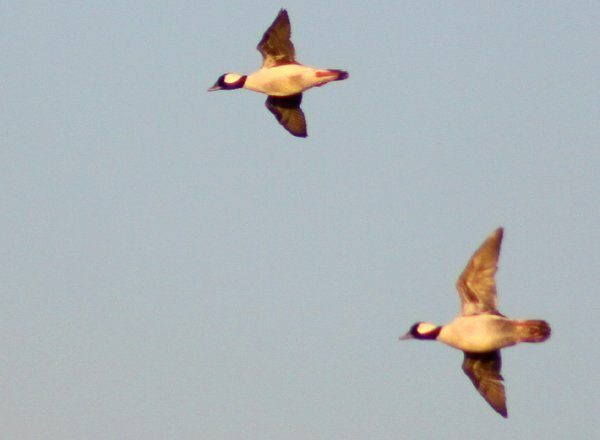 Because of is huge range and large and growing population it is classified as a Species of Least Concern, great news for those who like to feel the gaze of the Bufflehead upon them. All of the shots in this post were taken on 1 March 2011 at Jamaica Bay Wildlife Refuge’s West Pond as the sun was going down. Enjoy. If you liked this post featuring Bufflehead images why not check out 10,000 Clicks, our collection of photo-galleries? There is something for everyone at 10,000 Clicks! Great shots! I love that second-to-last one, with the blue sky and what looks like late afternoon light. Beautiful. 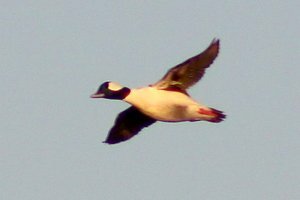 I agree – Buffleheads are anything but bland. The black and white plumage of the males reminds me of formal wear – very snazzy! 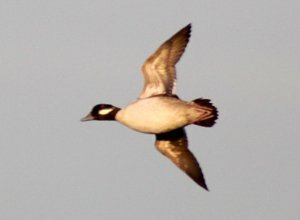 I’ve spotted Buffleheads a few times here in Oregon, part of their winter range. One place I’ve seen them is in southeast Portland. Bufflehead. The name says it all. I love to watch them swimming, I love to watch them diving, I love to watch them preening, love to see them flying, sitting, standing, upside-down, sideways, day, night, winter, summer, in sun, fog, rain, hail, snow. They are the Mighty Ducks! A very nice set of action images. Well done! Nice flight shots of a lovely duck. Wonderfully written and nicely photographed. Good Show!